Course length & structure: 800m returning at Bondi Beach - see more information on the Course page. Swim Timing: all swimmers will be given a timing strap, which must be removed when you cross the finish line. We will have a team collecting all the timing anklets. Unfortunately if you lose your timing strap you will have to pay $20 to our timing partner, to replace the chip. It is important you hydrate, eat a little, warm up & stretch - MOST IMPORTANTLY KNOW THE CONDITIONS. Go down to the beach early, watch the beach, ocean activity and other swimmers who are setting off prior to you. Bondi Beach can be subject to wind and swell, so it is important to come down early and check out the conditions, look at the course and plan your best approach. The Junior Ocean Swim will run prior to the Bondi Bay, so do come down early to support them. All swimmers need to mark off their name on the morning at the registration tables in the Bondi Beach Event Site. Registrations open at 7:30am, so you can collect your timing ankle strap and your wave's coloured swim cap. You will need to know what wave you are registered in and go to that table. Our friendly volunteers from Bronte Surf Life Saving Club are there to help you so please come prepared with your wave number to avoid delays. Don't be late, registrations close 30 minutes before your event commences. Late entries will be accepted on the day - $25 cash only. This event is all about participation, so we want to reward people for just getting involved! There will be lucky draw prizes at the presentation within the Club, following the conclusion of the Dash for Cash. 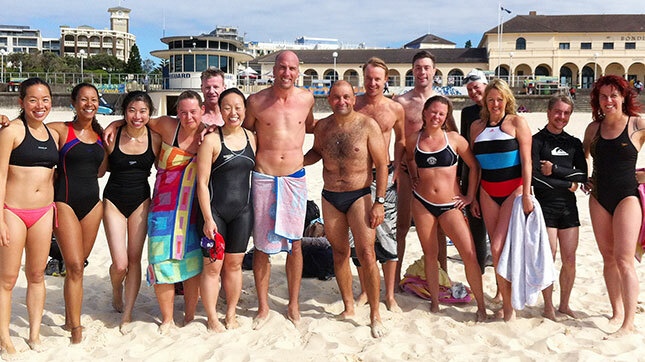 All participants of the Bondi Bay Swim will be in the running for the lucky draws, with names being chosen randomly. You must be there to accept your prize, so stick around, grab a drink from the bar and sausage sanger from the BBQ. Our sponsors and event partners will be donating these prizes, with more details to follow. Bondi Beach provides metered parking in the Park Drive and ticketed parking in Queen Elizabeth Drive. Bronte Beach offers paid parking in the Bronte Beach Cutting car park. Many competitors park at Bronte and walk the coastal walk from Bronte to Bondi and leave their personal belongings in the security area, which is bagged and transported back to Bronte, prior to the completion of the swim. Both Bronte and Bondi Beaches provide great public transport options. Bronte Beach is linked by the NEW 440 bus service to Central Railway Station via Bondi Junction Railway Station with buses running on a Sunday every 20 mins. Bondi Junction Railway Station is located at the end of the Eastern Suburbs railway line with a regular service to Martin Place and Town Hall, in the city and Central Railway Station. Bondi Beach has a number of Bus Services (365, 380, 381, L82), running every 10 mins to Circular Quay and Central Railway Station. Be part of the Event Crew! All Volunteers are eligible for patrol hours, get an Event Crew T-Shirt, breakfast, lunch and a complimentary drink in the Club bar after the event. Help The Kids Cancer Project to find a cure for Childhood Cancer. Start fundraising today! Get all the news, goss and updates on this years Ocean Swim from Event Management.